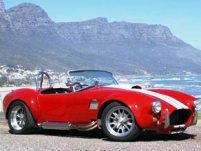 AAAX Adventure Classic Car Hire Cape Town. Classic Car AC Cobra 5.7lt 2003. RHD. R5980 for a minmum of 2 days, R2990 per day thereafter, 100kms free p.d. R7/km thereafter. Standard insurance. R15,000 insurance excess deposit. MINIMUM 2 DAY BOOKING - 2 seater, Automatic, Minimum age 25. R850 pd 200 kilos gratis. MINIMUM 2 DAY BOOKING - minimum radius of 200 kms from Cape Town, seat 4/5, Auto, air-con, Radio CD iPod aux in, leather seats. R650 pd 200 kms gratis. MINIMUM 2 DAY BOOKING - minimum radius of 200 kms from Cape Town - seats 4, Auto, air-con, Radio CD iPod aux in, leather seats. R3380 for 2 day minimum. R950 pd 200 kilos gratis.
. Enjoy the beauty of the Cape's gorgeous coastline. Drive up the West Coast to Langebaan or enjoy a trip to Cape Point. Head out along Camps Bay beachfront, or take in the wine route and amazing farmlands of Paarl and Stellenbosch. Make a trip up the coast to Hermanus to see the whales and the beautiful Cape beaches. A deposit/excess/fines amount is authorized to secure the reservation. This amount is authorized with the bank to be withheld from the credit card. The amount is not drawn from the credit card but merely withheld by the bank. Once this has been completed, the rental amount is drawn from the credit card. When the vehicle is returned undamaged, the credit card authorization is cancelled. Vehicles must be paid in full before they are delivered. Payments for the rental amount can be paid in cash or via internet banking with proof of payment, but this must be pre-arranged with management. MINIMUM BOOKING OF 2 DAYS!